Germany's 1-0 defeat to Mexico at the 2018 World Cup sent shockwaves across the globe, prompting widespread debate about what went wrong for the reigning champions and how to fix it. The solution appears to have been a very simple one against Sweden: starting Marco Reus. The 29-year-old began as a substitute at the Luzhniki Stadium in Moscow and only came on in the 60th minute for Sami Khedira. And while he stated afterwards that he was "obviously disappointed not to have played from the beginning," he also revealed that such a strategy has long been planned by head coach Joachim Löw. Germany 2-1 Sweden - As it happened! The Germany tactician is a big admirer of Reus, but has been careful not to overburden him following his return from damaged ligaments in last year's DFB Cup final. The Dortmund star only returned to competitive action in mid-February, making 11 Bundesliga appearances between then and the end of the season. "I knew back in our training camp [that I'd be a substitute] because we're assuming it'll be a long tournament for us," said Reus after the final whistle against Mexico, before saying that the intention was for him to play "mainly in the important games". Although the implication there is that he is being reserved for the business end of the tournament, gathering his strength before being unleashed when it matters most, there was little doubt that Germany's next match against Sweden fell squarely into the "important" category. Löw's initial analysis of the loss to El Tri was that he would "not throw out our plans altogether," but that "corrections would be made". One such correction was to bring Reus into the starting line-up. Why? The Borussia Dortmund No.11 is the definition of a game-changer, a beautifully balanced attacker who can operate from the wing, in the middle behind the striker or even up front himself. Reus is able to take his marker on down the wing and cross or go for goal himself from any distance. The former Borussia Mönchengladbach man found the net seven times in those 11 Bundesliga appearances in 2017/18 – and only going the full 90 minutes on four occasions. Bringing him into the starting XI paid dividends for Germany against Sweden, with Reus a constant threat across the front line, switching positions regularly with Thomas Müller and Timo Werner. His bursts to the byline caused panic in the Swedish box on several occasions, while it was no surprise that it was he who scored Germany's crucial equaliser in a last-gasp 2-1 win that kept the team in the tournament. 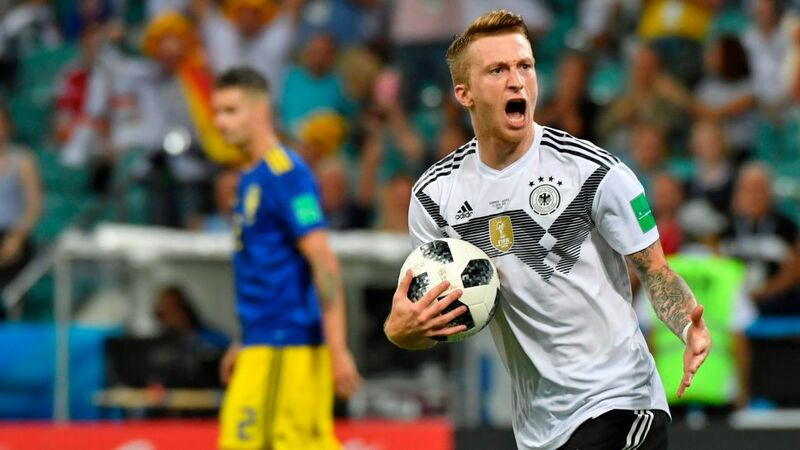 Despite now having ten goals in 33 caps for Germany, though, one of Reus' strongest attributes is that he immediately puts defenders on edge, unnerving them with his pace, directness and ability to play off either foot. The fact he has a pass completion rate of 79 per cent – and remember these are often high-risk balls in the final third – adds to his threat. "He's an incredibly skilful and intelligent player, a real handful for the opposition," said Löw in the build-up to the World Cup. "He's so able, he makes it look so easy and playful. His timing is spot-on, even his passing. He's clinical. He's making a really good impression […] Marco's like a rocket." With Germany now needing another win over South Korea in order to progress to the knockout rounds at Russia 2018, there seems little doubt about who they will turn to. Click here for everything you need to know about Germany's title defence!